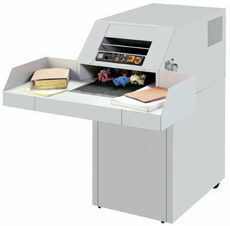 For organizations with a need for high volume shredding, an in-house shredding program based around Destroyit high capacity shredders is the most secure and economical way of disposing sensitive documents. Using a shredding service adds needless risk and expense. When you turn over documents to an outside company for disposal, you are effectively relinquishing control of your document security program. The more hands your documents pass through, the greater the chance they will be viewed by others. Depending on model, three-ring binders, VHS tapes, CD’s and even entire wastebasket contents can be fed into these powerful Destroyit shredders..
Shred speed 60 ft./min. 53 ft./min. Shipping weight 994 lbs. 983 lbs. Electrical requirements 220 V, 3 ph.